The Bible says "Let He Who is Without Sin Cast the First Stone" John 8:7. Fortunately, in our United States Senate, we have just such a man. 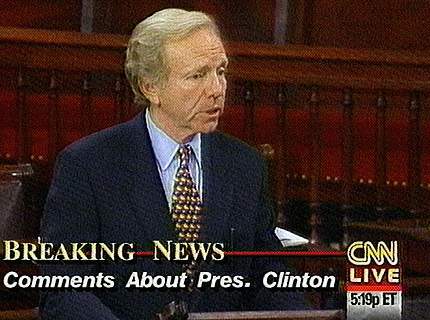 Accordingly, yesterday, Senator Joseph I. Lieberman cast the first stone at President Clinton. Joseph I. Lieberman described the President's conduct as "immoral" and "harmful." It is with great relief that we have such an upstanding and sinless person in the United States Senate as Senator Lieberman.